Venezuela’s leader Nicolas Maduro has announced that the country has defeated an alleged US-sponsored coup which was reportedly plotted by five Air Force officers. The coup plan involved an attack on the presidential palace or another top target, Maduro said. “On these dates, February 12 and 13, during the commemoration events, [the plot was to] fly a 'Tucano' airplane, arm the Tucano and attack the Miraflores [Presidential] Palace, or whichever location I would have been when participating in any one of these events. And then later attack other targets which they had outlined before," Maduro said, as quoted by AP. 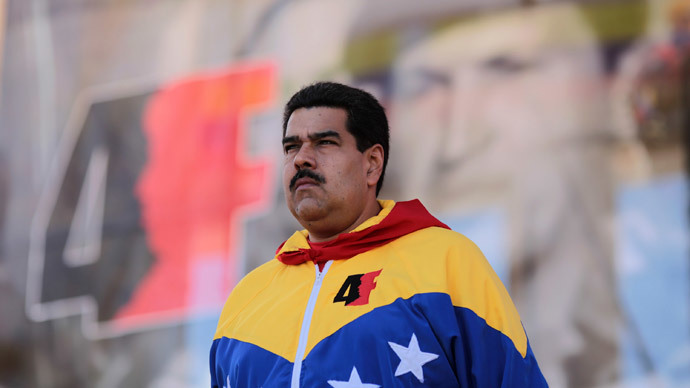 The alleged plot was uncovered by the Venezuelan intelligence agency, and one of the participating officers was connected to the right-wing forces allegedly planning to provoke a wave of violence. According to Maduro, the military man was given financial aid, as well as a US visa, which permitted him to leave on February 3. The president provided no concrete evidence of the alleged coup. It is not the first time that Maduro has said there has been an attempted coup against his government. At the beginning of February, the president accused US Vice President Joe Biden of orchestrating a plot against Venezuela. Last December, Maduro announced “recordings” disclosing the US plan to bribe and corrupt Venezuelan authorities. Relations between Venezuela and the US have been hostile for a few years: they have not sent ambassadors to each other’s countries since 2010, and instead have chargé d’affaires running their embassies.